East of Scotland Branch and Regimental Association would like to welcome its newest member in the name of George Redpath, from Tranent, George served from 1964 to 1976, he served with the Battalion in the Pipes and Drums. Basic job description is park cars assist guests with luggage from cars and Taxis. Very low key security assistance. Gratuities are good I personally made £4500+ last year (this is not guaranteed) depends on you as a meet and greeter. Shift pattern earlies 7-15 middle 10-18 lates 15-23. NOW JUST OVER 2 WEEKS till our Regimental Annual Reunion, please don’t leave it till the last Minute for your tickets. This event is open to all our Regimental family and friends. I require numbers of personnel attending by Monday 22nd April for the catering purposes. Tickets Cost £20 and can be paid by Cheque / Postal Order or by Bank Transfer, please PM me for more details. Come and support Your Regimental Annual Reunion on Saturday 27th April. Hope to see everyone attending the Gladdy Murray Trophy which will be held at Shaw Park Golf Club, Alloa on the 22 Sept 19. Please be at the Club house for 0900 hrs. CENTRAL BRANCH UPDATE – Pie, Peas & Bingo 7th May Whitburn Football Club. Unfortunately, due to unforseen circumstances, this has had to be cancelled until further notice. The Committee would like to apologise to anyone who was intending to support us on the night. Please keep watching out for further updates in relation to the next one. The Regimental Office will be closed for Easter from 19th to 24th April inclusive. This year’s Edinburgh Armed Forces Day will now be held on Saturday 22 June 2019. There will be full details sent out in due course but this is just to inform every one of the recent change. This years Fallen Comrade Trophy event will be held at Westerwood Golf Club, 1 St. Andrews Drive Nr Glasgow G68 0EW. On Sunday the 07th April 2019, first tee time is booked for 1100 hrs and then 8 minutes intervals until everyone has tee’d off. The cost of the competition is £35 per person. If everyone can start to meet up from 0930 hrs so that we can get the necessary admin out of the way and allow the admins to sort flights out. If you can PM David Milne or Brian McGeachie so that we can capture all those wanting to take part. Please pass the word around about our competition. All donations for prizes or raffle will be gratefully appreciated. 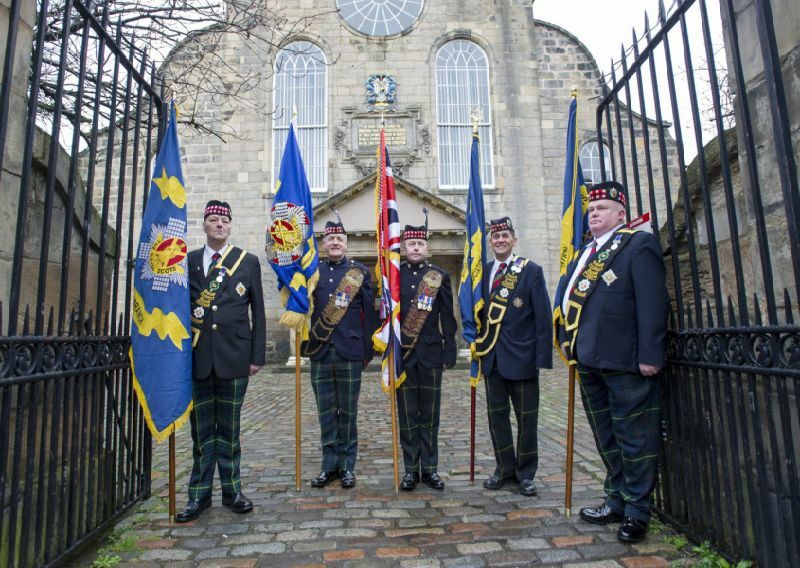 Royal Scots standard bearers outside before the Royal Scots Club commemorative church service at Canongate Kirk, Edinburgh.